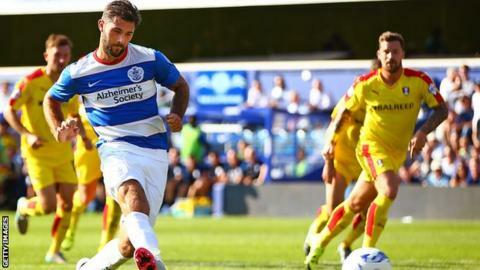 QPR manager Chris Ramsey says he has no "indication" that striker Charlie Austin will leave Loftus Road this summer, despite intense speculation. Austin, who has been linked with a £15m move to the Premier League, scored twice against Rotherham in the Championship on Saturday. The 26-year-old netted 18 times in the top flight last season. "I hope he stays. No one has given us any indication that we are going to lose him," said Ramsey. Ramsey, whose side beat the Millers 4-2 to move up to sixth in the Championship table, added that uncapped Austin can earn a spot in England's 2016 European Championships squad even if he is playing in the second tier. "Ambition is a big thing. When you're a footballer you want to play at the highest level you can and there are the Euros coming up," Ramsey said. "But England boss Roy Hodgson has played players from the Championship before. Charlie might be better off staying here and scoring a hatful of goals. "We hope he ends up staying here, scoring another 20 goals and possibly getting his move next season."